← Progress is Progress, DAMMIT! I “think” I’ve finally worked this out, so it’s a good time to share. For any writer who’s stuck looking at their thousandth draft, and unsure where to begin cutting, this one’s for you. The synopsis that I’d been writing, summarizing every scene and event in my 130k + words manuscript, was complete. This was no cute little synopsis, but a big-bull behemoth in its own right, sitting at about 30k words (just look at it in the centre of that pic). It recounts everything in the story down to he-said-she-said-stab-stab-stabby details. But then I started to read. Oh. Oh dear. It was still a tangle, and just as impossible to know where to start. Everything seemed connected to everything else, and excising one small part had so many knock-on effects it took all evening to resolve each one. The synopsis went into too much detail, and so… my plan had failed. On the bright side, it did make it incredibly easy to make sweeping changes and tighten up the plot. Re-jigging things was much easier, as I could zip through the whole plot in an hour, and get a good top-down view on the characters’ journeys. Some serious re-arranging got done using this long-synopsis, and I think the story is a lot stronger for it. I don’t think I could have done this with a shorter synopsis – too many gaps would have left out the important details. So it wasn’t all bad news, but still – I needed a new plan. That’s why I’ve written another, shorter synopsis! Not the one-page kind you’d send to an agent after getting a bite, but a 3000+ word plot summary (I didn’t leave out any sub-plots, because they each contribute to the central plot, but I did abbreviate them to their bare minimum). 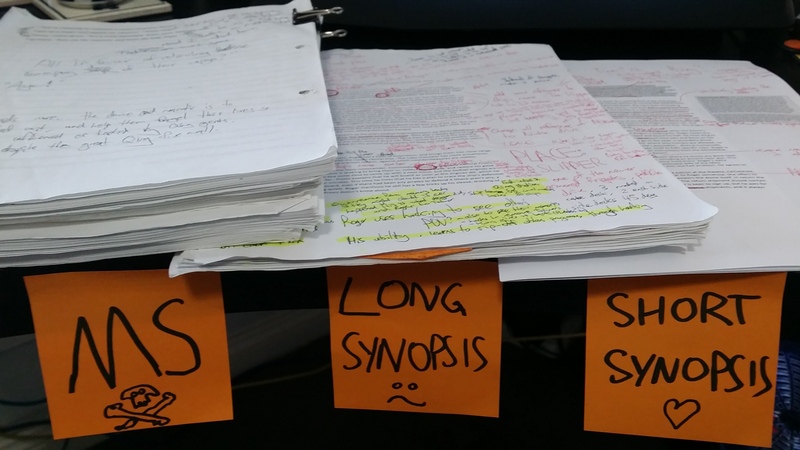 On the first read through, comparing to the long synopsis, I cut out FIVE ENTIRE SCENES. Now this was progress! I could see that those scenes didn’t need to be there, because they didn’t get a mention in the short synopsis, and thus they weren’t needed for the core plot-line of the story. My “darlings” were exposed, and I chopped them up mercilessly. Several scenes that had seemed hopelessly convoluted, but essential nevertheless, were now obviously meant to be combined into one shorter, punchier scene. Sections that introduced a character, left them, came back, developed them more… were instead smooshed together in a single shorter block. Timelines found themselves chopped and changed. The purpose of these characters and scenes is now more quickly illuminated to the reader, because we don’t just shake their hand and move on… but instead we stay with them a while. By the end of this week I’ll try to begin re-writing the manuscript itself again, and I’m pretty excited about that! Have you had any “eureka” moments in your own editing struggles? I’d love to hear and learn from you. This entry was posted in Writing and tagged books, editing, fiction, goals, manuscript, Planning, Writing. Bookmark the permalink. 2 Responses to How to Find the Fat in My Manuscript? Writing a shorter synopsis is a great idea! Happy to hear that it allowed you to trim some fat. Yeah, a detailed synopsis sounds great in theory, but it didn’t work for me either. Too many tangles and tangents and details that might get snipped in an upcoming draft. I realized this last year when I got rid of my detailed notes and switched to a more barebones plotting method (3 high level Acts, plus 10 or so bullets under each Act). There needs to be structure but not too much structure… because then it takes the fun out of writing! I agree that there has to be enough set-up in each section of the story, or else the chapters will feel random (i.e. : no cause and effect). I’m currently editing Draft 3 to add more set-up. Fun! Good luck with the manuscript re-write! Woah, that’s a really barebones way to go! I’ll need to do something like that eventually so that I can distil my short synopsis down for agent querying. NOT looking forward to it. Hope the 3rd draft is coming together for you. I guess in my case I semi-pantsed the first two drafts, so there wasn’t enough structure in place back when I needed it! Oh well, I can use the excuse that I didn’t know what shape that structure would take until the pansting had taken its course?